Accommodation can make or break your skiing holiday, but opting to stay in a luxury alpine chalet can take the stress out of organising your trip. 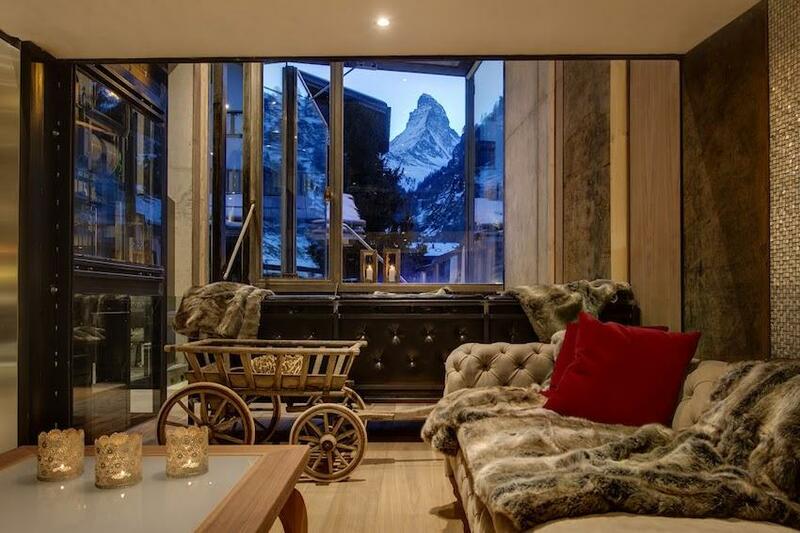 However, all luxury chalets were not created equally, as is outlined by Zermatt’s highly acclaimed architect and designer, Heinz Julen, who has highlighted this fact with his latest property, Backstage Luxury Loft. The prestigious property is one of Luxury & Services' favourite alpine ski chalets. The dedication and work that has gone into this luxurious ski chalet perfectly resembles the quality of service we offer. Designed in Julen’s unique industrial meets art deco style, the Backstage Luxury Loft presents a very tempting proposition for discerning skiers with a penchant for unwinding in elegance after a day on the slopes. This exemplary addition to Zermatt's increasing collection of luxury chalets sleeps ten people in five en-suite bedrooms. The property is ideally located in a quiet residential area of the town, overlooking the river and a short stroll from the Matterhorn Express ski lift. The huge loft contains 600m² of habitable space and offers a truly unique design. The large, airy, open-plan kitchen/living/dining area is central to the main structure, which is enhanced by steel pillars that support the high ceiling and an ornate chandelier that is suspended above a feature glass dining table. The Loft features floor-to-ceiling windows that boast spectacular views of the town and surrounding mountains, including the iconic Matterhorn. All the furniture and furnishings have been developed and manufactured in Heinz Julen’s Zermatt studio and the interiors are decorated with locally sourced contemporary art. All the rooms showcase the designer’s distinctive style of mixing materials and contrasting classical features with ultra-modern equipment. Two of the bedrooms are housed in a separate glass-encased chalet that is 700 years old and adjoins the main structure. The design has been accentuated to draw attention to the preexisting, original wooden beams. The Backstage Luxury Loft is a relaxing haven to return to after a long day on the slopes. A separate sitting room - which comes complete with staples of any luxury ski apartment, comfortable statement sofas and a large fireplace - is the perfect place to enjoy the champagne and canapes provided every evening. There is a dedicated team of professionals on hand to assist guests with anything they need and gourmet dinners are prepared by an expert chef six nights a week. This Loft is the epitome of luxury, and provides every possible amenity to help you unwind, from a home cinema to an indoor jacuzzi and a small fitness room. If you require transportation to your ski chalet this winter, you should consider renting a comfortable SUV from Luxury & Services to reach the mountains in style. Our prestige vehicles are perfect for alpine conditions and offer numerous features, such as iPod connection, high-tech sound systems and assisted parking. The transfer from Geneva airport to Zermatt takes almost 3 hours; rent an SUV to ensure that your journey is as luxurious as your holiday.